The Spoof of #UKIP That Backfired. 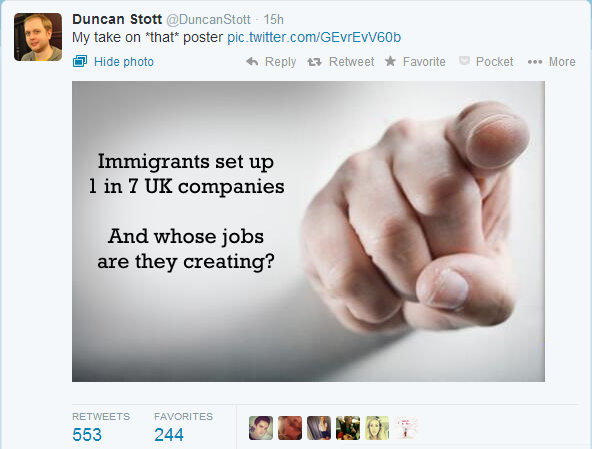 "Migrants create our jobs" (oops no, most don't). UKIP have a new poster campaign out - the usual anti-UKIP suspects have repeated their usual old, stale, incorrect, anti-UKIP creed. Ok... so three Indians and a Californian... hang on what has this to do with the EU? These people aren't European! Actually... there is an EU connection - because UK *cannot* control EU migration, UK is having to restrict migration from these countries! The ones where so many of the 'contributing' migrants have come from! But remember - UKIP don't want to close UK borders - that is a LibLabCon straw man! - UKIP just want to control it! Let in the beneficial migrants!! Keep out the bad ones. The real problem with the public sector is that it doesn't know when to stop. New projects are always a gamble. You are going to put in effort in the hope of a more valuable return. Private citizens have limited resources, so when a project doesn't workout in a reasonable timeframe they will cut their losses, abandon it and move on. However, the public sector (making up about half the UK economy) have almost unlimited resources. If a project is not working out, they always have the option of doubling up - like a gambler betting on a coin toss, doubling his bet every time he loses so should he eventually win he will get back everything he has gambles so far, and the same again as profit. The problem here is that projects are not coin tosses - there is no law of averages that says that a project will eventually come good. So when a public sector project isn't working out, and it gets expanded (more money, more people, more scope) to double up the stake/(potential) return - it actually becomes less likely that any return will be had - but those behind the project will not want to lose face by admitting their initial mistake/failure so will keep doubling up, again and again until they find a plausible scape goat for a failure and then heap all the blame on them. The risk of failure is what make businesses strive to succeed - in the public sector there is no such risk, there is always the taxpayers wallets to be raided. This only goes completely off the rails when rank amateurs (the ilk of Gordon Brown) take it to a complete extreme and end up gambling the entire wealth of the country! At this point, only a war will divert attention from such in competence so we get dragged into foreign conflicts that are nothing to do with us - with our 'opponents' being the instantly created 'scapegoats' for the public sector failure. 'Good' is what is left when all 'bad' has been cut away - the public sector have no mechanism, reason or drive to cut away the bad. Quite the opposite, 'bad' has resources thrown at it in the futile hope that it can be made good - it can't it is precisely what stops 'good' emerging. The Birth Control Pill - much better herd control than Vallium. The most important human trait is personality, everything else about someone has been learned and comes from the outside. How they react to other people and the things they learn is all their own - it is what make them, them - it is what makes them human. We have learned that our hormones have a strong impact on how we express our personality. But as long as it remains within acceptable boundaries society is much bothered. In fact if it modifies the expression of ones personality in certain ways, it may be of benefit to the state and so encouraged. Valium was useful to control women for a while, but the better, safer, birth control pill has now replaced it. Instead of making women into dozy, dreamy stay at homes, they are thrusting, self-reliant, independent, selfish worker modules. Unfortunately, in neither case are they themselves. What I have read about this clearly confirms that this is well known - even if not fully comprehended. Many women say the pill has changed their personality - but if they are concerned about a particular aspect of this they are advised to change to a different pill - not to return them to normal, but just to lose the bit of change they are concerned about. Think, if men were permanently tanked up on artificial testosterone - as long as they didn't quite cross the line into being overly aggressive, no one would care much - but they wouldn't be themselves. Think further, if most men were in this state, common traits would simply disappear as they all tended towards this limit, away from normality. Whatever else this mass medication is doing - good or bad - it is interfering with the most important trait that a human being has - their very own, natural, personality. Many anti government bods hate UKIP... they miss the point...Next Stop Liberty. There is quite a swathe of people disillusioned with politics in the UK, all of whom you might think would support UKIP. However this is not always the case, there is a substantial group who are completely anti-politics, and include they UKIP as part of that. Not only that, they go further and especially hate UKIP for (as they claim) preserving the illusion that politics can work. They are sure that UKIP is just another bunch of wannabes who want a slice of the political pie for themselves, and will simply replace the LibDems as the fleas on the LabCon rats who eat all our food. Of course no one can be *sure* of anything in the future - if UKIP start getting power the usual, nasty, suspects will start infiltrating - the strength of UKIP is actually its leader - you can choose whether or not to trust an individual, but panels, committees etc are really unaccountable, unpredictable and untrustworthy. However looking at the bigger picture, nothing beats *experience* in convincing a human about an issue. You can persuade people who don't have experience, they have to choose what to believe - however once they have experience, their knowledge is unshakable. So UKIP is a win/win for those who don't trust our politics - if UKIP clean it up, everyone will be happy. But, if they *do* turn out to be more of the same then the entire population of the UK will, once and for all, have direct experience and proof that our politics cannot be fixed from within. So if UKIP do turn out to be more of the same, then the ranks of those completely opposed to UK politics will be swelled by many thousands - and people will know there is only one way to 'take it back'. Mans nature is to be free and independent. Free will is one of his defining features, a capacity to decide for himself what he would most like to do. However free will can only be manifest when it can be acted upon. To stifle a mans implementation of his free will is to stifle his humanity. Man is a sociable creature, even ignoring the necessity for reproducing, our sheer numbers mean it can be no other way. Free will and sociability are in direct conflict, when one mans free will meets anothers there will be disagreement. Ultimately superiority can be resolved by the death of one of the conflicting parties - but given the risks associated with this (both physically in the act, and the time consuming inconvenience of resolving disputes in this way) other methods of dispute resolution have come to the fore. Of all the social structures that have been built to avoid violence and death (although these always remain as options - through policing, and war), the most obvious we see to day is 'government'. Government, a body to whom men delegate their use of violence and death in the expectation that every man will have their free will stifled less than by any other method. However, the delegation of such powers is a dangerous, risky business. Should the body decide that it has its own 'will' to enforce, it will conflict with those of the men who created it (after all it can only be said to have a 'will' if it is different to that of those who created it). And in resolving such conflict, it has been given the ultimate tools to ensure that its own will prevails, while man has surrendered his. Man will have built the mechanism for his own enslavement. It is thus vital to a free humanity that no such body ever has a 'will' of its own. Man created government as his servant, as his tool, government owes everything to man, man owes government nothing. Clearly, government must never be allowed to become mans master. In most countries now, there are written constitutions that restrict their governments power - however as is seen time and time again, these rarely work for long as people see the government overstepping the mark and need revolution to put government back in its place. The UK has a different model, ultimate power in the UK is not held by government, but by parliament. 'Parliament is sovereign', the UK 'constitution' is whatever our MP's, on the day, say it is. For convenience and practicality, voluntary systems are in place which may make it seem different, but the fact is that our MP's are our defence against the (naturally, inevitably) tyrannical desire of our government. MP's are there to ensure government remains small, to ensure that it has no will of its own, to ensure that the free will of each man is maximised. Here in the UK this process has been substantially perverted - with MP's coming to believe that they are the leaders, that their will can be imposed on us via the government they are supposed to be regulating and restraining. Our MP's have been corrupted, the entire process by which they are even given a chance of becoming an MP is now designed to ensure their real loyalty is not to constituents they profess to serve, but instead to the idea that they are the 'rightful' power over us all. This corruption is seen as strong 'political parties', and is spread by the corruption of our education system (and now social services) in grooming our children for servitude instead of self-realisation. The Americans have their written constitution - ultimately enforced by their right to bear arms, and a belief that they will use that right to protect it. The UK has its MP's on the day - they are all that protect us from tyranny. don't vote for a LibLabCon party stooge - vote for an individual committed to protecting your right to have, and to act on your own, individual, human, free will. EU, Crimea, EU, Ukraine and Russia - Governments use force against citizens, not states. States/Governments are happy to use violence against their own people, but wary of using it against armed foreign states/governments. The people of Crimea did not seek independence from Ukraine earlier because they knew their government would happily use force against them. As protestors around the world know, states/governments real grip on power is maintained by force. The Ukrainian forces (police and army) in Crimea would have been deployed against the Crimean people in a flash, had they sought independence themselves. However, like all States/Governments the Ukrainian government, while holding their own citizens in contempt, think twice about such behaviour towards a fully armed foreign state. Hence, with Russian state backing, the people of Crimea could then act as they wanted, and get independence, without the threat of force from the Ukrainian government. The willingness of states to use force against citizens is getting ever worse - and is actually the primary tool in the EU's totalitarian toolbox. Many, many citizens of EU members do not want to remain in the EU - but their governments are groomed and encouraged to warn and show they are willing to use force against them. This is openly demonstrated every time a government are said to have shown 'leadership'... in this context 'leadership' means forcing citizens to act against their will/interest under the threat of force. Government 'leadership' is self-evidently an evil that should be viewed with fear and disgust, not with pride. Governments are not the saviours of the citizens, they are the greatest threat against them. LibLabCon are 100% signed up to this agenda. UKIP are not (yet) we need UKIP to break this slide and put measures in place (direct democracy) so it can never happen in the UK again. Britons never, never, never should have been made EU/State slaves.